Building your audience and keeping them engaged is one of the first and most important things we have to do as entrepreneurs, because if you don’t have an audience then who’s hearing your message or taking advantage of what you’re creating? Since I started building my audience in 2011 I’ve tried lots of different things and talked about lots of different strategies in my blog posts. I’ve talked about the importance of building your email list, the power of Facebook groups and Facebook in general and a few other things, but in this session we’re not talking about any of that! We’re talking about using live hangouts and gamification as a way to grow and engage with your audience. And joining us this week to teach us all about it is the amazing Yifat Cohen, founder of YCN Media Group, she took the time to share her incredible top tips on building an online community, and showing us how live hangouts and gamification can really benefit your community and your business! GIVEAWAY: Make sure you leave a comment below and let us know if you have your own community (or are thinking about starting one?) and which of Yifat’s tips you think you’ll want to implement yourself, and be in with a chance of winning a 6 month pass to the Members’ Club! Yifat Cohen is the founder of YCN Media Group and a “hangout expert”, showing others how to grow their community and network using live hangout sessions. In most communities out there you’re probably not connecting in realtime with other members, it’s likely that you post a message or start a conversation and then end up waiting for a response, then you reply to that person and end up waiting again for their response back. Using live hangouts is going to eliminate that wait and it’s going to connect you and your community to each other live! You’ll see the people in your community transform because you’re interacting with them live and this will have such a big impact on your business and your community. Let’s say you choose to do a one hour live hangout with your community and you split your time so the first 30 minutes is where you are sharing your content that you’ve prepared and then the rest of the time is where you interact with your audience. The second 30 minutes is where you’re going to be able to engage with your community, meet your people, bond with them and help them, and you’re really going to learn a lot about your community as well as be able to take a lot away from your hangout to build content for the future. Whether you’re learning new things from your community, meeting new members, asking/answering questions and gaining amazing insight from your audience, everyone involved is going to benefit in some way, whether it is directly from you as the expert or whether it’s from the other members in your community. When your users love the community you have created and they feel like it is their own, this is when you’re going to see them wanting to contribute more, sharing their own expertise and helping others. Once they feel like this is their community they are going to serve others, because it’s really rewarding to be able to share advice and help others out. Whether that be sharing blog posts, sharing free guides or information, asking & answering questions and more! In turn your community functions because of the people in it who are interacting and ultimately as they build relationships with each other and share their knowledge & expertise, your community is now creating content for you. If you have your own community, try gamifying your content. Creating a way for your members to move up a progression ladder makes sure that your members are taking action when it comes to the content that you’re putting out there, and you can do this using a fun game. As your members complete more and more of your content they are climbing up the ladder, they could collect points the more they complete or you could award badges e.g. Best Blogger of the Week. Doing this gives your members recognition within your community and it makes your members get into good habits with your content, the more action they take, the better the transformations they’re going to experience as a result of your content. This can be a huge influencer because if they make amazing breakthroughs they are likely to recommend you and give amazing feedback or testimonials. 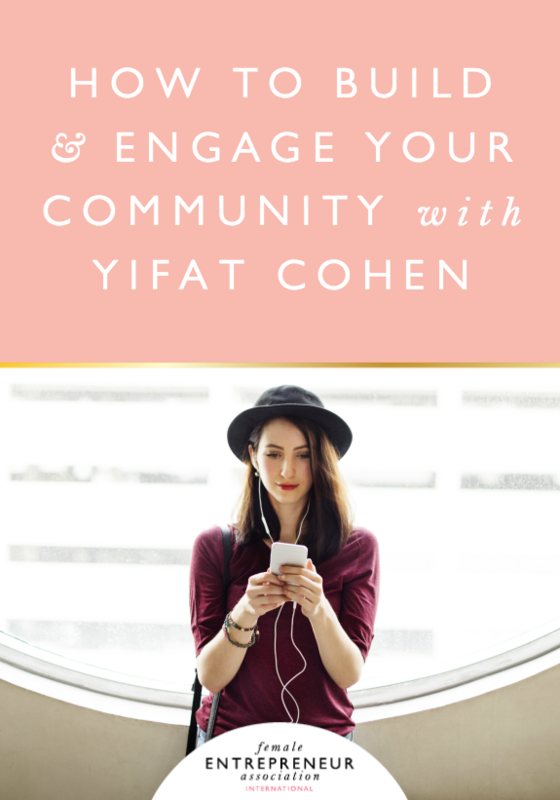 Take the time to consider how implementing Yifat’s tips in your own community could benefit you, or if you’re keen to get started with your own community we’d love to hear what kind of a community you would like to create. To Be Entered to Win: Leave a comment below and let us know if you have your own community (or are thinking about starting one?) and which of Yifat’s tips you think you’ll want to implement yourself – we’d love to know! See you next week for another 10-Minute Masterclass! P.S. If you’re not already a subscriber, sign up below so you don’t miss next week’s Masterclass!